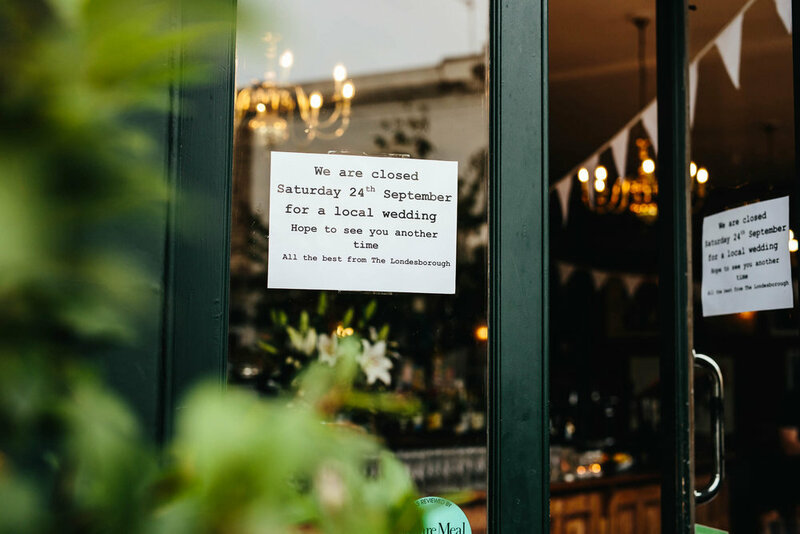 More and more frequently couples are veering away from the larger traditional wedding venues to have their wedding receptions in local pubs. This is especially true for many of the London weddings I shoot where the ceremony happens at a local registry office or town hall and then the guests can either bus or even walk to a nearby pub. Often it's a local favourite of the couple which gives it a personal and intimate connection. Pubs tend to be relaxed, informal and flexible and offer a cool and contemporary decor. They are happy for you to decorate and to run the day as you want it without sticking too rigidly to timings and rules. Food is often big sharing platters and traditional and substantial pub grub that is always popular. It can also be the cheaper option - some city pubs close at weekends so don't ask for a cover charge whilst other pubs are happy to close to regulars if you can cover a minimum spend. This one is pretty local to me and also to my brides Alice and Sinead, in the heart of Stoke Newington. They took their guests here after their Islington Town Hall Wedding for an informal party and speeches. For the full wedding see the blog. Filled with quirky artworks and with a cute little outdoor patio. Fantastic locally sourced food, a big open and light dining room with another room upstairs for the disco. They also have a outdoor patio. As with all of the pubs I'm mentioning, the staff are welcoming, friendly and laid back. Blog coming soon. Another one close to me in Dalston is The Roost. This converted victorian pub is now a venue and shoot space only venue. Filled with an eclectic mix of wall finishes, furniture, props & art work, it can be as creative and malleable as you wish. The old bar, commercial kitchen and mature garden space are at the heart of the building leaving the rest as both a colourful & blank palette. It also has a basement club to surprise your guests with as an evenings finale. To see the full wedding of Charlie and Lucy see the blog here. A bit smaller and darker so less ideal for photography but great location on Wimbledon Common with great spots for taking pictures. Cosy and traditional food. A perfect pub to follow an Islington Town Hall wedding as it's only a 10 minute walk. They have a small room upstairs which seats around 30 people. It's light, intimate, the food is impeccable and I really love shooting in this space. For the full blog for this wedding click here.